The first one relates the first inhabitants with Pelasgians, from whom many toponyms have survived up to now, such as Pelinaion, Kronos, Dotion, Larisson, et al. 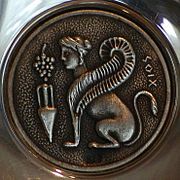 According to the second version the first settler was Oinopion, son of Dionysos or Theseus and Ariadne, who came from Crete. The island was named Chios after his daughter's name, nymph Chion. A third version, cited by historian Isidoros, says the name Chios comes by the Phoenicians and means mastic in the Syrian language. Most probably the final band of colonists before the Ionians were Abantes from Euboia. Tradition refers to a king Amphiklos who came to Chios in response to a delphic oracle and, four generations later, King Hector, who expelled the former inhabitants of the island. The destruction of the Mycenaean settlement at Emporio coincides with beginning of Ionia colonization. Ancient Chios Circa 1000BC the first Greeks, Ionians from Boeotia, Attica and the Eastern Peloponnese gradually colonized the islands of Chios and Samos along with 10 cities on Asia Minor, founding the Ionian Dodecapolis. Its center was the sanctuary of Panionion, near Mykale, which eventually, from a religious and festive synod, acquired the form of Koinon (federation of States). Chios flourished and became great naval power. It has been generally accepted that Homer was a native of Chios in the 8th century BC. In the following centuries Chios produced other influential individuals including the 5th century tragic poet Ion, the 4th century historian Theopompus, and several important sculptors in the 6th and 5th centuries, one of whom, Glaucus, was credited with inventing the soldering of metals. The Massacre at Chios by Eugene Delacroix. This and the works of Lord Byron did much to draw the attention of mainland Europe to the catastrophe that had taken place in Chios (1824 -- Musee du Louvre, Paris). The blowing up of the Nasuh Ali Pasha's flagship by Constantine Kanaris, painted by Nikiphoros Lytras -- (Averoff Gallery). Byzantine and Genovese times Chios came under the Byzantine Greeks. In the 13th century, in the aftermath of the 4th Crusade, first the Venetians and then the Genoese moved in. Chios actually prospered under the Genoese. Ottoman occupation The Turks took over Chios in 1566. In 1821 Chios joined Samos in the general revolt of Greeks against the Turks, and the next year the Turks singled out Chios for particular punishment, slaughtering an estimated 25.000 Chios and enslaving 80.000; those who escaped went to other islands or on to major cities around the world. Later that year the Greek admiral Kanaris, entered the harbor of Chios at night and blew up the Turkish flagship. Chios gained revenge of sort by entering the immortal realm of art when both Delacroix and Hugo commemorated the terrible massacre of 1822. A major earthquake in 1881 also left many islanders dead. Recent Times Chios rejoined the rest of independent Greece after the First Balkan War (1912). The Greek Navy liberated Chios in November 1912 in a hard fought but brief amphibious operation. Turkey recognized Greece's annexation of Chios and the other Aegean islands by the London Treaty of 1913. It was affected by the population exchanges after the Greco-Turkish War of 1919-1922, the incoming Greek refugees settling in the, previously Turkish, Kastro and in new settlements hurriedly built south of Chios Town. During World War II, the island was occupied by the Germans (1941-44), resulting in severe deprivation for the inhabitants. Today, the island has perhaps the highest per capita income of any "nomos" (prefecturate) of Greece thanks to the fact the Chians own roughly fifty percent of the Greek merchant marine or about 12% of the world's merchant marine and to the presence of large Chian communities in New York and London which maintain strong ties with the island. Tourism, other than visiting diaspora Chians, is a negligible factor in the island's economy. Chios is home to a Greek ship-owning fraternity, including the families of Livanos and Chandris, who were from the island.